We cut through the jargon to explain the basic concepts and terminology of colour theory, in words that you can understand. Colour is such a pervasive part of everything we visually encounter in the world that for many designers, it becomes an intuitive choice. If you think back to school though, you'll recall being told at a young age that there are three primary colours – red, yellow, and blue. We were all taught that any colour can be created by mixing these three colours in varying quantities. It turns out that this isn't quite the whole story (although it's still workable enough to be taught to five-year-olds). Understanding how colour is formed and, more importantly, the relationships between different colours, can help you to use colour more effectively in your designs, and make sure you pick the right palette for your projects. The theory of colour is a discipline that stretches back much further than that – at least to the 15th century – and uses physics, chemistry and mathematics to fully define and explain the concepts. However, much of this is unnecessary to being able to use colour effectively. There are two primary colour systems – methods by which colour is reproduced: additive and subtractive (also known as reflective). We use both on a daily basis – screens use additive colour to generate all the colours you see, while books use subtractive colour for their front covers. Subtractive colour, like additive, has three primary colours – cyan, magenta, and yellow (CMY). In subtractive colour, white is the absence of colour, while black is the combination of colour, but it’s an imperfect system. The pigments we have available to use don't fully absorb light (preventing reflected colour wavelengths), so we have to add a fourth compensating pigment to account for this limitation. We call this 'key', hence CMYK, but essentially it's black. Without this additional pigment, the closest to black we'd be able to render in print would be a muddy brown. 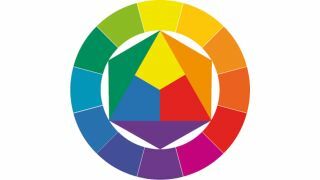 The colour wheel allows us to see at a glance which colours are complementary (opposite on the wheel), analogous (adjacent on the wheel), triadic (three colours positioned at 120 degrees on the wheel from each other) and so on. Each of these relationships can produce pleasing colour combinations. There are many more pleasing relationships between colours based on their position on the wheel. There are free apps for picking a colour scheme, or you could use your designer's eye to pick your own. Click through to the next page for a little help on this.